Arnside is the quintessential English village: a pier, breathtaking views across to the Lakes, and a vintage style parade of shops selling ice cream, crafts and tasty baked goods. 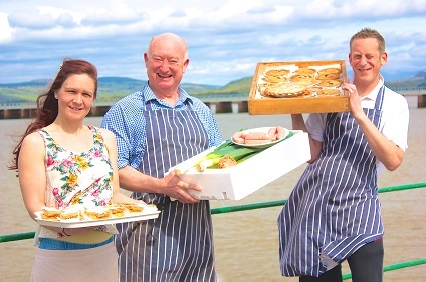 At the far end of the Promenade is Arnside’s Old Bakehouse, run by Bill and Sue Ridgway since January 2015, but the heritage of the Old Bakehouse goes back much further – there have been ovens on the site for over 70 years and it has become a staple for both the local community and visitors alike. Products from the Old Bakehouse are made using local produce – the meat for the pies is from Burrow’s Butchers in Silverdale, for good quality and low food miles. The vegetables are Lancashire grown and delivered by Speight’s of Lancaster. Even the Old Bakehouse’s baker, Mark Watson, is local produce! He grew up in Arnside and his first job, at age 11, was working in the Old Bakehouse kitchen. Some years later, after working as a senior baker in Manchester, Leeds and Spain, and finally running the Greenodd Bakery near Ulverston, Mark was invited to return to the Old Bakehouse when the Ridgways took it over. As well as using local produce, Mark makes local specialities including his great Grandma’s closely guarded tea loaf recipe. He also continues to develop the Old Bakehouse’s menu to meet customer requirements. Visitors to Arnside and Silverdale AONB are often outdoorsy people needing hearty food, and one of the Old Bakehouse’s biggest sellers is the new date slice that can be popped in a backpack and eaten halfway through a ramble – most delicious on top of Arnside Knott or Warton Crag, looking at the stunning views.